Four Roses Bourbon tells BourbonBlog.com that on May 1st, 2013 a unique, bourbon decanter featuring the likeness of Secretariat with jockey Ron Turcotte aboard will be released exclusively at the Kentucky Derby Museum. The 750 ml decanter will be filled with premium Four Roses bourbon hand-selected by owner Penny Chenery during a scheduled Four Roses private barrel selection at the warehouse and bottling facility located in Cox’s Creek, KY in March 2013. At 91, Penny is a Bourbon enthusiast a looks forward to being a part of the selection of this limited edition Four Roses Bourbon. Only 500 limited-edition, hand-numbered decanters will be produced for this commemorative 40th anniversary year. The ceramic decanters were created by the Secretariat team in the style of the 70’s era collectible decanters that became popular among fans and whiskey connoisseurs. “Fast horses and fine Bourbon are two of my favorite things. 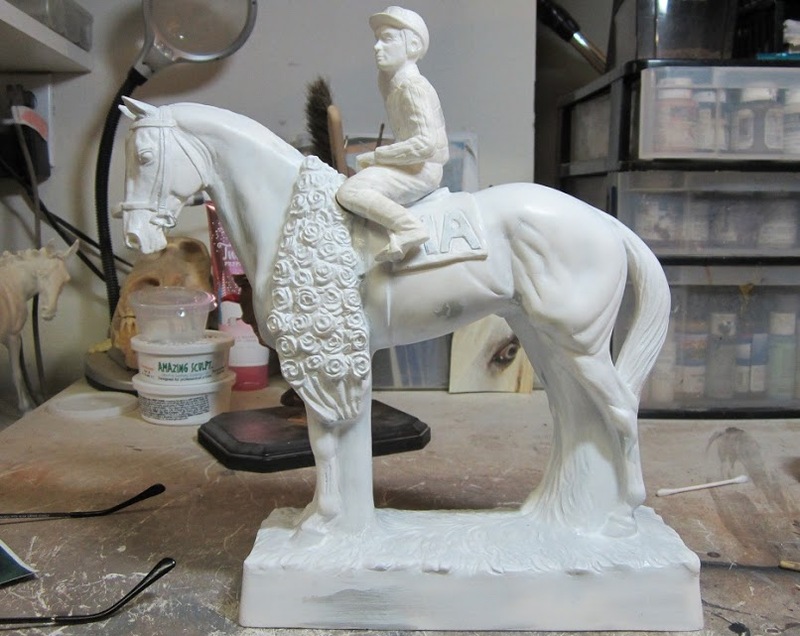 I am delighted to partner with Four Roses and the Kentucky Derby Museum in lending Secretariat’s name to this very special decanter for racing fans and Bourbon connoisseurs alike,” Chenery tells us. Thoroughbred legend, Secretariat, is widely renowned as the most popular name in Thoroughbred racing. Beginning with his run in the 99th Kentucky Derby, Secretariat, smashed long-standing track records in 1973 and captured the hearts of Americans through his Triple Crown sweep. The chestnut champion affectionately known as “Big Red,” and his owner, Penny Chenery, became an inspiration to many in a story of will, determination and pure speed. 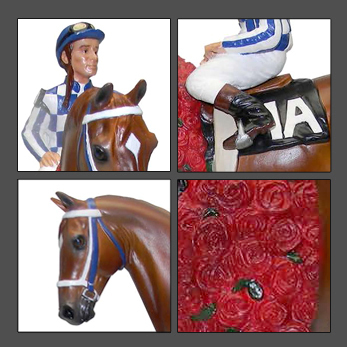 On the evening of Wednesday, May 1st fans from around the country will be the first to see the decanter and have the exclusive opportunity to purchase one hand-signed by both Penny Chenery and Ron Turcotte. Guests at this cocktail reception can enjoy a tasting of the select bourbon carefully chosen by Chenery (a longtime bourbon aficionado) and hear from her directly about the choice. Joined on stage by Four Roses’ Master Distiller, Jim Rutledge, the pair will casually guide guests through the tasting experience. Jockey Ron Turcotte will also be on hand to sign merchandise and meet guests at the event. Master Distiller, Jim Rutledge tells BourbonBlog.com, “We, at Four Roses, are very proud to have our Kentucky Bourbon chosen by Penny to celebrate the greatest thoroughbred race horse of all time. In addition to the exclusive decanter celebrating Secretariat’s 1973 Triple Crown, Four Roses will publicly release a special barrel selection, limited edition Secretariat bottle. The commemorative bottle will feature Secretariat and be adorned with the distinctive blue and white checks of the famed Meadow Stable silks. With limited distribution at select stores along the Triple Crown trail in Kentucky, Maryland and New York. It will also be available for purchase in advance at the Derby Museum. 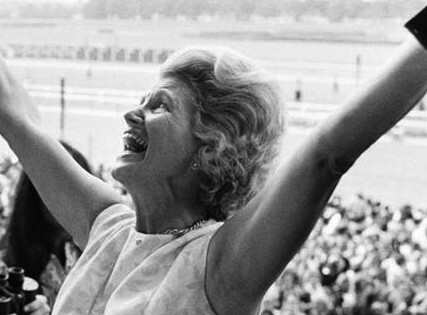 Penny Chenery, owner of Secretariat, reacts after winning the 1973 Triple Crown. When Christopher Chenery became gravely ill in the late 1960s, The Meadow’s future was in doubt and daughter Penny was the only one of his children willing to continue the operation. Despite the fact she lived with her husband, John Tweedy, and her four children in Colorado, Penny made the decision to continue her father’s legacy in Virginia. She balanced roles as housewife and mother adding horse owner and businesswoman to her titles with frequent cross country travel. Penny brought a keen business sense to Meadow Stable but also had the wisdom to take advantage of the partnerships her father had built, working closely with Arthur B. “Bull” Hancock, Jr. of Claiborne Farm. Ron Turcotte was a native of Canada. He was from a large family and worked as a lumberjack during his youth. He started working for E.P. Taylor, owner of 1964 Kentucky Derby winner Northern Dancer, in 1960 and eventually rode for him. 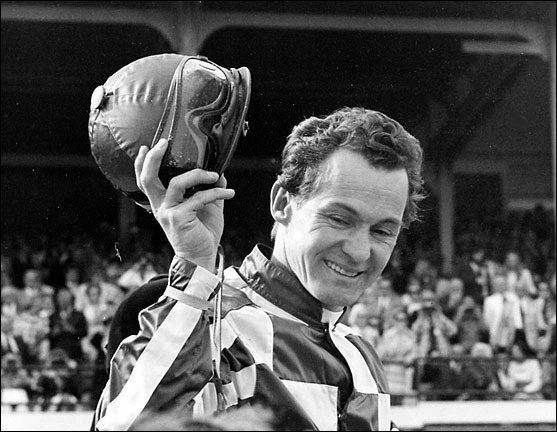 Turcotte had great success riding in his native country, winning Canadian jockey titles in 1962 and 1963, and in the United States, winning the 1965 Preakness Stakes aboard Tom Rolfe. Ron had ridden for Lucien Laurin in the mid 1960s and became the regular rider for Meadow’s Riva Ridge when the colt’s previous jockey was suspended. Turcotte was already familiar with Riva, as the two teamed up previously for a win in the 1971 Flash Stakes at Saratoga.